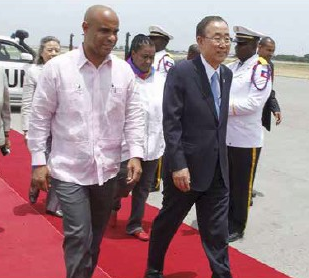 United Nations Secretary General Ban Ki-moon visited Haiti on Jul. 14-15 in an effort to resuscitate a stalled $2.2 billion UN plan to eliminate cholera from Haiti over the next decade. Launched in December 2012, the UN “initiative” was really nothing more than the repackaging of the “Initiative for the Elimination of Cholera in the Island of Hispaniola” launched by the Haitian and Dominican governments in January 2012, as Jonathon Katz and Tom Murphy pointed out in a scathing “Foreign Policy” article. Since the UN rebranded the plan, it has been unable in over 18 months to raise even the $400 million needed to fund the project for its first two years. Meanwhile, the UN spent some $609 million to deploy about 7,000 UN soldiers in Haiti during FY 2013/2014 as part of the thoroughly despised and almost weekly protested decade-old UN Mission to Stabilize Haiti (MINUSTAH). It was, in fact, MINUSTAH soldiers from Nepal who imported cholera into Haiti by allowing sewage from their outhouses to flow into the headwaters of Haiti’s largest river in October 2010, at least ten scientific studies, including one commissioned by the UN itself, agree. However, the UN has refused to accept legal responsibility for causing what is now the world’s worst cholera epidemic, which has killed over 8,500 and sickened over 704,000 Haitians. Three lawsuits have been filed in New York courts demanding reparations and an apology from the UN for its negligence in Haiti. The UN has claimed it has immunity, and UN officials have been hiding from court officers trying to serve them with papers, although one server caught up with Ban Ki-moon at The Asia Society in late June. In Haiti, Ban Ki-moon and his wife, joined by Prime Minister Laurent Lamothe, engaged in an extended photo-op to deflect criticism and say that the UN had a “moral duty” to help stop the spread of cholera in Haiti. Along with Lamothe, Ban also helped launch the Haitian government’s “Total Sanitation Campaign,” a five-year plan, already funded with $14 million from Canada and Japan, which aims to improve sanitation for 3.8 million Haitians in 20 cholera-plagued rural communes. The Boston-based Institute for Justice and Democracy in Haiti (IJDH) and the Port-au-Prince-based Office of International Lawyers (BAI) were the first lawyers to bring a lawsuit in the New York courts on behalf of 5,000 cholera victims in October 2013. The lawsuit came after the UN claimed immunity after the IJDH/BAI lawyers attempted to seek redress through the UN’s own grievance system in November 2011. The IJDH/BAI lawyers are trying to have the case litigated as a class-action lawsuit. “Secretary-General Ban’s visit demonstrates why Haiti needs justice, not charity,” IJDH lawyer Brian Concannon, Jr. told Haïti Liberté. Ban also met with President Michel Martelly as well as the presidents of Haiti’s House of Deputies and Senate to discuss the political impasse over Haiti’s unconstitutional electoral council, which Martelly has sought to unilaterally impose. “We are outraged that Ban Ki-Moon comes here to hypocritically say he cares about our plight while at the same time he refuses to take responsibility for unleashing cholera in Haiti,” said Oxygène David of the party Dessalines Coordination (KOD), whose militants made up more than half of the demonstrators at Route Neuf. After Haiti, Ban Ki-moon travels to the Dominican Republic, where he will meet with President Danilo Medina.